Operators Vesa Hämäläinen (left) and Jaakko Karjalainen observe—and if necessary steer—the moves of the actuated machine during a test run at VTT. It is early February and the thermometer has dropped to minus 29 degrees Celsius ... cold, even by Finnish standards, and the wind doesn't help. "We highly recommend not going out tonight. This is supposed to be the coldest night of the year," says the receptionist in the hotel lobby as she hands over the room keys. We willingly follow her advice. The next morning the mercury hasn't budged. Dressed for an arctic expedition and equipped with tires that have spikes, the group of technical officers from the ITER Organization drives through Tampere for twenty minutes to reach VTT, the Technical Research Centre of Finland. 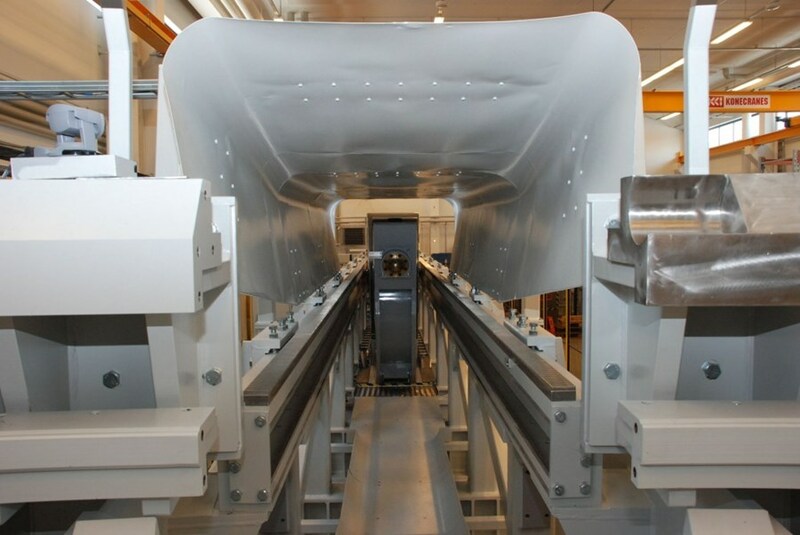 It is here that ITER's European Domestic Agency has built the test-stand for the ITER divertor, the component within the machine that will have to face the highest thermal loads during operations—the heat flux will be up to 20 MW/m². The fact that, of all the places in the world, the divertor is being tested here in Europe's "icehouse" is the standing joke. Engineer Karoliina Saminen welcomes the group by saying, "Yes, here in Tampere we are used to extreme conditions!" Why is water preferred to oil in the hydraulic systems? Inside the ITER vacuum vessel any leakage of oil would be very hard to clean. Also leakages—whether oil or mineralized water— would become activated. Demineralized water is hence preferred for the hydraulic systems. The climatic conditions, of course, are not the reason why the Divertor Test Platform 2 (DTP2) has been established in Finland. It is rather because of the long experience that engineers at VTT and those at the nearby Tampere University of Technology have in the field of water hydraulics. As oil is a "no go" in a nuclear environment such as ITER, (see textbox) water is the only fluid that can be used within the hydraulics that will move ten-tonne divertor cassettes into position with millimetre precision. On this morning in early February, the group is present to witness, once again, what "millimetre precision" truly means. 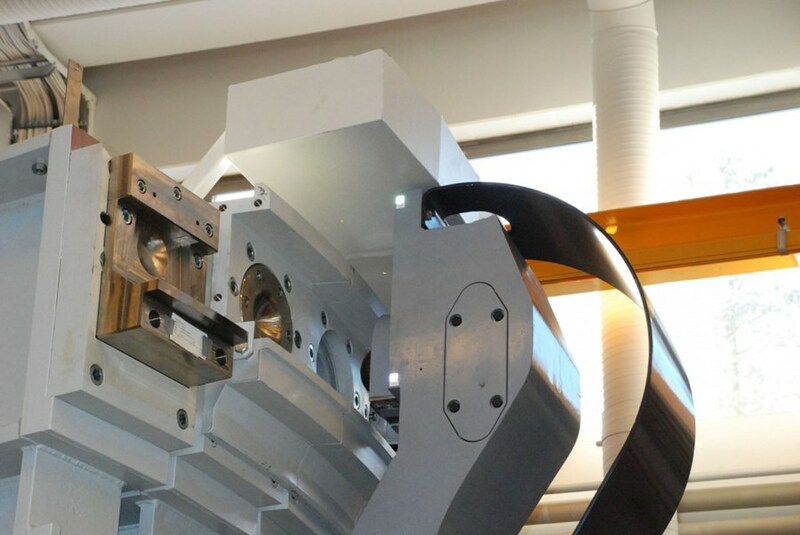 As an electrical servo-motor actuates the giant structure, the DTP cassette multi mover (CMM) transports a divertor cassette (3.5 metres long x 2.5 metres high) through the remote handling port and into the ITER-scale vacuum chamber. While the CMM is bedded on rails, the actual cassette is only county levered by a special end effector. Transport must be executed with pinpoint accuracy because the trajectory is such that delicate plasma-facing elements of the cassette have to pass within a couple of centimetres of the vacuum vessel surfaces. The cassette, which has been preloaded with a force of ten tons to withstand the electromagnetic forces acting on it, needs to be tilted, returned to vertical position, and pushed to one side before its knuckle can lock into its final position. "This is what I call an acrobatic design," says engineer Alex Martin, who has witnessed this procedure many times—and each time with fascination. Inside the giant: the divertor cassette approaching the vacuum vessel through the remote handling port. Given the extreme forces in play in fusion reactions, maintenance will be among the critical success factors of the ITER Project. Once deuterium-tritium (D-T) operation begins, it will be impossible to make changes, conduct inspections, or repair any of the Tokamak components in the activated areas other than by remote handling. Knowing that this will be the threshold for the success of ITER, it was decided about five years ago to build a full test-stand for the divertor and to test the tools and the technology. 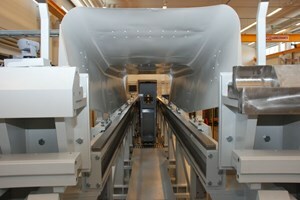 DTP-2 was finally inaugurated and today, the test-stand is almost complete. The only thing left to install is the cassette toroidal mover which will be responsible for moving cassettes around the corner—"the most difficult part of the operation," according to Mario Merola, Head of ITER's Internal Components Divison. The DTP test stand is operated from a control room within the huge hall at VTT. From there, operators like Vesa Hämäläinen and Jaakko Karjalainen can observe and direct the moves of the actuated machine during the test runs. Operators rely upon virtual reality models, imitating future ITER operation when the remote handling operations will be conducted from a room located far from the vacuum chamber—and this with millimetre accuracy. Failure is not an option! Behind their commands, Vesa and Jaakko are busy calibrating and testing the software and the camera viewing systems that will help them "to push the camel through the eye of a needle" as this difficult task was once described. There is not much headroom between the plasma-facing components and the vacuum vessel when the ten-tonne divertor cassette is moved into position. In the future, the cassette toroidal mover and a specially developed manipulator, allowing the remote installation and exchange of all cassettes within a 80-degree torus sequence, will be installed. This technology will ultimately ensure safe maintenance operations in ITER and fusion power plants, but may also be interesting for other industrial applications, as a look at the VTT's guest book shows. Here, engineers from all over the world have expressed their interest in this remote handling technology, and their fascination for it. One of the comments comes from the University of Utah: "I love your toys!" Click to watch the ITER video Like pushing a camel through the eye of a needle. Click again to watch VTT-produced video shot of remote operations at the DTP2.